The company is here, and as soon as it lands here, it starts changing things. Sometimes for the best, most of the time, for the worse! Read on! Same goes for one of the most reliable mobile networks around. 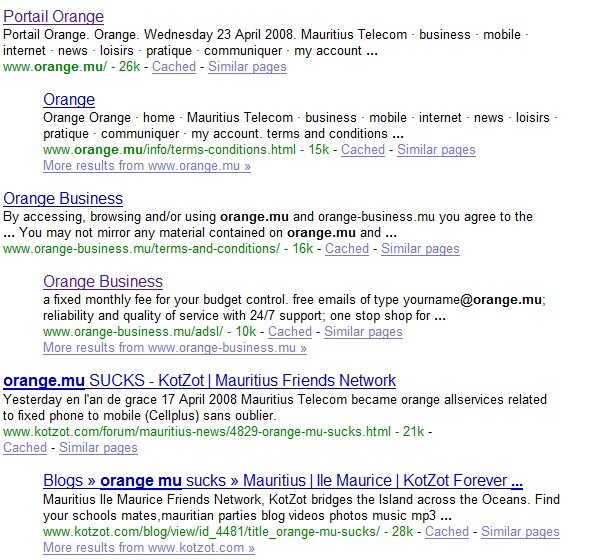 Cellplus has turned into Orange, to the greatest delight of Emtel, who boasts a 100% Mauritian network nowadays. Notice that Fair Usage thing being mentioned?? It wasn’t there before! Home 128K and 512K were uncapped! Unlimited usage! 24h/7d + unlimited bandwidth? Now? Your ADSL connection is capped! ii. what will happen if my use is very high? If you only occasionally have very high usage, we’re unlikely to be concerned. If your usage continues to be very high, we’ll advise you if your usage is excessive. Ultimately, if your usage still remains excessive, we may have reduce the transmission speed of the service whilst we monitor your usage. There you go folks! Reduction in speed and monitoring of usage. This means? i) Your connection gets way slower if you go over the limit! What’s the limit? Not mentioned. Might be 1 GB, might be 500MB, might be 10GB, might be 100GB. It’s at their discretion! Your connection speed might drop to as much as 1/2 its speed! ii) Your usage is monitored. Abuse the limit often, and you are on a permanent block list. Or maybe you’ll get a letter which politely tells you to move to another ISP or plainly, “f*ck off!”? Big brother will be watching! There ya go folks. MyT is capped. Now ex-Wanadoo ADSL is also capped! I’ve been expecting a 8Mbps connection (uncapped), just as Orange offers in France, as I have mentioned in my previous post However, I think it’ll only be a dream. 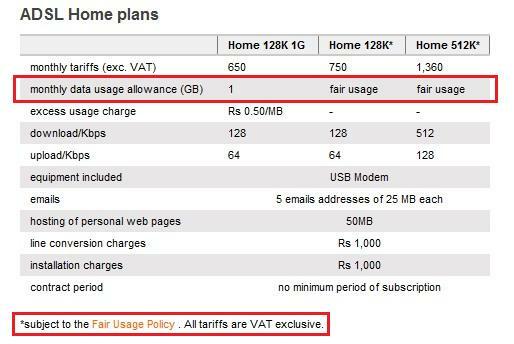 I’ve heard of 2Mbps being offered for businesses at Rs.10500 ($385) something, but considering the price, it’s useless for home users. Too bad. Btw, check out Tiscali’s Fair Use Policy, which I find very agreeable. What do you think? Tiscali’s Fair Usage Policy is designed to make sure your broadband service is quick and reliable whenever you use it. A very small number of customers use Peer to Peer or file sharing software, which constantly sends and receives video and other very large files, throughout the day. This type of activity uses a lot of bandwidth and can significantly reduce the speed at which other customers can access the internet during peak hours. Approximately 1% of customers use more than 30% of the available bandwidth during peak hours. We don’t believe this is fair to the vast majority of our customers. This fair usage policy automatically identifies the very small number of extremely heavy users and manages their bandwidth only during peak hours (6pm to 11pm Monday to Sunday), to protect the service for all our other customers. Outside peak hours, the use of the internet by these heavy users is unaffected. During peak hours, customers affected by the fair usage policy will share bandwidth with each other and will be separated from other customers (contention?). The amount of bandwidth available for affected customers to share, will be at least as much as for those customers unaffected by the policy. The speed affected customers experience when downloading at peak hours will therefore depend on what these customers are doing. If they are all web-browsing and reading emails, they will experience normal broadband speed. If on the other hand they are using Peer to Peer or file sharing software they will experience slow broadband speed. Outside of peak hours, no restrictions will apply. Capping is used throughout the world. Capping at 10GB. Capping at 20 GB. Capping at 50GB. Capping at 100GB. I’ve even seen capping at 300GB somewhere in UK. But here, a ridiculous 1GB is imposed! This is fun. I think people in charge here do not know about the existence of such things as YouTube, iTunes, online radios, streaming TV shows, people that download nightly builds of Linux and other software and the likes. For them, downloading 10GB per month necessarily means you are a pirate, and that your access to bandwidth needs to be restricted. Lemme see you folks use YouTube and similar streaming sites, and not go over your 1GB. Listen to some online radio, like 2 hours or so. You will easily go over 300MB of downloaded data with high quality streams. Do that 3 times and you are nearly over quota. That’s it. 3 days of online radio per month. Download 2 Linux or other open-source distros, and you are over-quota. Just plain lol! I’ve noticed something weird btw… This morning, my 512K “uncapped” connection was going to a crawl. Now it seems to be better. I may not be over-quota yet, but during peak hours, browsing was impossible? Doomsday signs? Cyber Island. Yes! It’s like our “information superhighway” has had speed breakers installed. Considering that our superhighway was 2 lanes big, with loads of pot-holes, it has just become slower! RIP, Mauritius Telecom. Glory to the ISP who provided uncapped connections. And hurray to Orange who provides capped connections. Yaaay… we’ll be back to stone age very fast, with capped 56K connections! Hip hip hip, hurray for Mauritius. MT really knows how to choose its strategic partners! What can I do to remain in quota? Drop heavy downloads. No more DVD downloading off torrents. No more P2P. This means, no Limewire, no Bearshare, no EMule, and paradoxically, no more buying stuff off iTunes! Do not schedule multi-downloads. If one of them breaks, and you lose the others, you have to restart again, losing bandwidth. No more abusing YouTube and similar video streaming sites. No more streaming audio online. Compromise on quality. Get VBR instead of high quality MP3’s. Get RMVBs instead of AVIs. Do not download unless you are sure your file works. Cut down your time spent on Internet. Well, if you see this page, you will know why people are generally dissatisfied with Orange, specially in UK. Compare with this one? Then drool!! And drool more! This is what we are all looking for! EDIT 2: My friend Yasir also wrote about Orange, here. 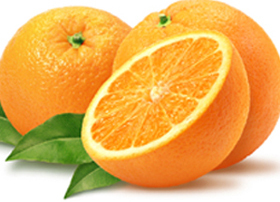 Seems the anti-Orange articles are growing in number day-by-day! “Fair Usage Policy is a good thing.. Why should my connection be slowed down by some fcking people who takes all the bandwidth with their unrestrained downloads! I know the frustration of being capped I have been using MyT since it’s introduction and surfing not downloading with a dial up was better than MyT, then I opted for Wanadoo ADSL 512k unlimited mais la avek FUP in no time I will be back to the same thing. someone even discourage to sue orange…. thanks for the support!! PAS VINE PRAN NOU POU BAN …. I’ll let you complete it with the word which seems the best for you. We all use ADSL for downloading. Lets unite to strike forward. We need to study our contract first and see what can be done next along with someone who can advise us. Wanadoo ADSL, the virgin land is no longer chaste. 😛 I was considering to migrate to Wanadoo ADSL, but now sticking with MyT is the most reasonable deal. Hey! We don’t always use our connections for downloading, Neel! I do browse… sometimes. Heavy browing. With 15+ tabs open. Sometimes. Anyways. I don’t get the reason why they must cap MY connection (me = heavy downloader) to give to THEM (them = casual user). I still pay my bill in full, even if I get capped. That’s plain unfair. I want my bandwidth too! I PAY FOR IT, just like the casual user! If they want to give everybody the bandwidth they want, they gotta upgrade their systems and networks. You can’t cut here and give there! If that’s their policy, we won’t be seeing Megabit internet to home users anytime soon. Forget FTTH, we won’t even see 8Mbps of classic ADSL. That’s plain unfair. I’d even go as far as calling that capping the IT development of Mauritius. That “cut-and-adjust” policy is not right. ISPs just don’t want to upgrade their networks. What if tomorrow 1Mbps became Rs.200. Tons of users will take it. But it’s priced at Rs.6000 cuz not many can afford it. If tons of users had 1Mbps, the network won’t handle the load. I guess that’s why it’s at Rs.6000. To decrease the network requirements? Now imagine the FUP has a 1GB cap! What can you do with that? I don’t know if this is a solution but if anyone thinks that downloading 24/7 can be a solution so do the same after all I’m paying for unlimited as per my contract so fuk orange.mu before they fuk us which will eventually happen sooner or later. Long live diehard downloaders(p2p, direct link, streaming media and all the Sh… that comes with)!!!!!!!! p.s just goggle orange.mu and you’ll see our blog is placed on 4th-5th position, on the 18-19th april it was placed 2nd. Lets fight evil with evil!!!!!!!!!! mo in write lor mediaguru lor blog..
mwa mo faire +40GB par mois! ! li pou tough pou mo ale live r 1 or 2 gb par mois.mo prefer servi la corde coco sa..Mtius?jamais pou vin cyber island.mais plitu..cybercallcenter and cyberidiotspeople! ! mais comment nu camarade in dire. ena cash lor cap la! ! ! ! ! You are a real heavy downloader! But 40GB according to international standards nowadays isn’t that big. Some companies’ FUP even go as high as 50GB per month. It’s not a big deal abroad. One thing 1 don’t get is how the heavy downloading of 1 user is going to affect the internet usage of the ‘casual’ user. God dammit, the reason why people are connected to ADSL services is for downloading, streaming purposes. People who don’t use internet as frequently as ‘heavy’ users should be given other packages like 10 hr/ month and 128 kbps. F*cking piece of shite ! It was supposed to be a rebranding strategy which should not have interfered with or modified current offers. I still believe it is illegal that Orange slipped the Fair Usage Policy (a new term) in the contract without asking the consent of the user. Orange..you’ll go to hell and you die! But to all those DL > 20 GB+ per month, that should serve you right. Share with your friends and you’ll DL less morons..
One user’s downloading doesn’t affect the network much. But if dozens and dozens of heavy users start using the network at the same time, the load increases and “casual” users don’t have much bandwidth left. IMHO, they should have increased the network performance to handle the additional load instead of their “cut-and-adjust” policies. Or they could have grouped the heavy users on on one contention channel during peak hours, then restore their contention during the day. This could solve the problem a bit. Ok Inf I agree with you. No one is a moron anyway, unless he acknowledges the fact that his intentions of over-downloading could help others in reducing their downloading chores. But that depends on your intentions. I know from some insider source at MT that 5-10% of Orange subscribers use about 80% of the bandwidth during peak hours. If browsing sluggishness is a particularity, then there’s definitely a problem somewhere. Remember, our plans to start a broadband cable project by HCL is all laid to waste now! Just like we are experiencing a rise in Independent Power Producers abroad, the same should apply to broadband in our country in the foreseeable future. No more capping and no more excuses in halting our Internet usage. Anyways… You are right. At the time they consider to be peak hours, most people are working, and the majority of heavy downloaders (students?) are at school So, I don’t think that heavy downloaders abusing their bandwidth at 2am has any effect on the “casual” user. They don’t want to upgrade their network for a small user base. Then why do they even think of operating MT? Be practical. So, UCL is that so p*ssed off to invest in Mauritius? You’re kidding. We know that you enjoy surfing and downloading music, movies and pictures. But we also know that this can get a little frustrating at times, as heavy users on our network can reduce the internet speed at your end. Heavy users download very large files 24 hrs a day, 7 days a week, leaving less bandwidth for the rest of you. And we think it’s unfair that you should not be getting good speeds when you surf the internet because of a very small number of users. To make sure everyone is getting the best quality connection speeds from us, we have set up monitoring tools to identify those few very heavy users and to manage their bandwidth. That’s why we have introduced the Fair Usage Policy. We know the majority of customers usage will always fall well within this policy, but this will also help us address any excessive usage, so you always get the most reliable broadband services. 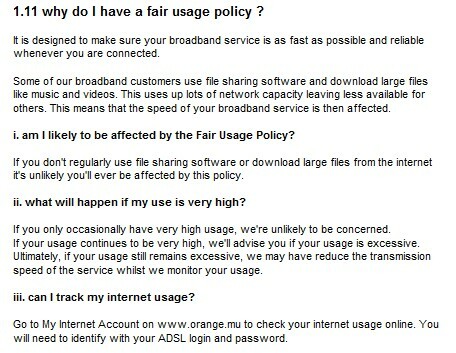 Click here for more information about the Fair Usage Policy and our new Orange ADSL Terms & Conditions. So the Orange folks assume that I, as an ADSL user downloads only MP3’s and Videos per month? What the?! If I assume that 1 MP3 file = 7MB approx (192Kbps)… that makes 28,000MB, effectively making the cap limit = 28GB at least for 512Kbps, right? Now, movies. If I assume DVD Rip, non-HD quality… 19,600MB or 19GB? So, what’s the capping for 512Kbps? 28+19 = 47GB? If so, it’s quite nice! just phone them yesterday, zot mem pas koner ki limit la eter so to be on the safe side I didn’t renew my RS account I’ll wait for one month and see what will it be as the operator told me lots of PIRATE pe download ek faire bizness that’s why one of the main raizon pou applique FUP.